The author is a nutritionist with Vita Plus serving central and western Wisconsin. 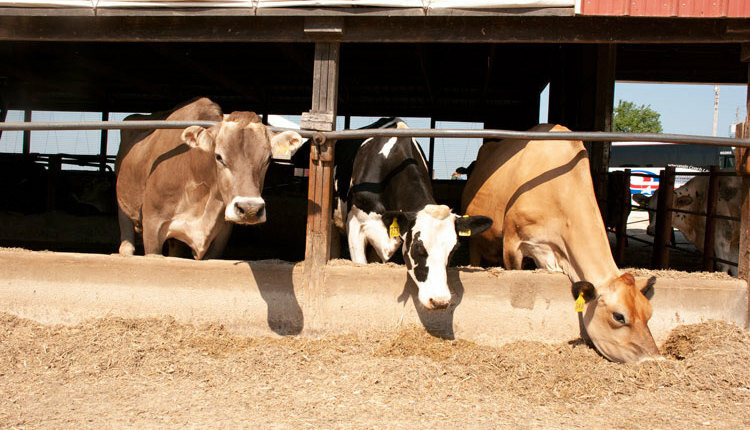 What do you consider a successful transition for a dairy cow? Is success measured by the absence of disease? A cow’s ability to ramp up milk production? Breeding back with relative ease? 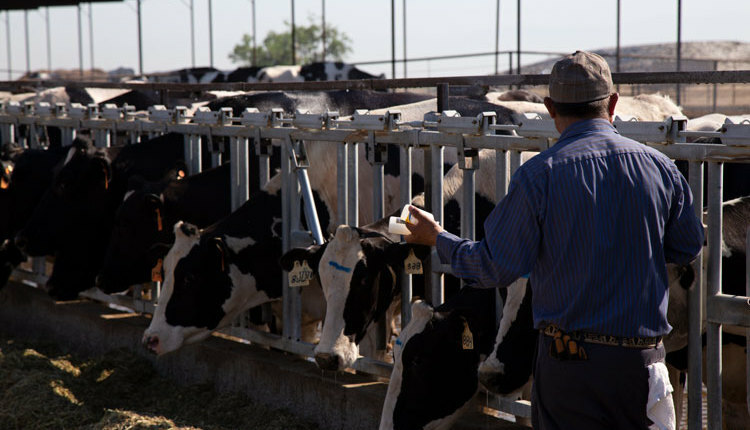 For many, the struggle to maintain transition cows with limited disease occurrence is real. This is especially relevant in times of low milk prices when nonessential feed additives are often removed from the ration to reduce costs. Fortunately, many strategies can effectively improve a cow’s chances of successfully navigating the transition period. To get you thinking about your program, here are a few strategies to consider. Here’s the thing: There is no one correct way to feed dry cows. All herds are at risk for experiencing transition issues. This is true if you feed anionic salts, low or high calcium diets, or high levels of straw or haylage. It’s also true if you prefer a single dry cow group or use a two-group system. Regardless of your strategy, the single greatest management factor impacting prefresh and postfresh animals is dry matter intake (DMI). Intake drives net energy balance. Cows can experience up to 12 weeks of negative energy balance during the transition period, which can lead to stunted milk curves and greater days open. Thus, caring for the pre- and postfresh cow is essential to achieving a successful transition. 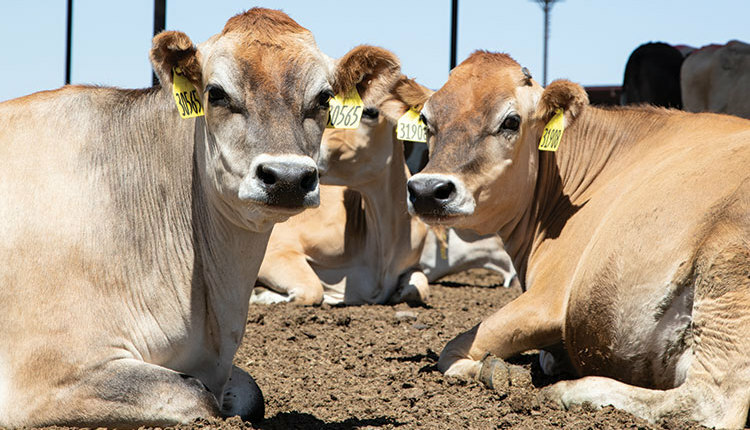 Many factors impact DMI during the transition period — body condition score, hoof health, and stocking density are just a few. To optimize DMI and reduce the duration of negative energy balance, shoot for body condition scores between 3.25 and 3.5 at dry-off. This reduces the risk of dystocia during calving. It also limits the volume of adipose (fat) tissue mobilized postcalving, and leads to a lower incidence of fatty liver and ketosis. It’s easy to overlook hoof health when thinking about DMI in the transition period. Hoof lesions are painful, and when cows cannot walk comfortably, they do not maximize feed intake. Have your hoof trimmer complete much-needed hoof remodeling at dry-off to allow for ample regrowth. Remember that dry cows benefit from a trip through the foot bath just as much as the milking cows do. Limiting the stocking density during the transition period is also crucial. 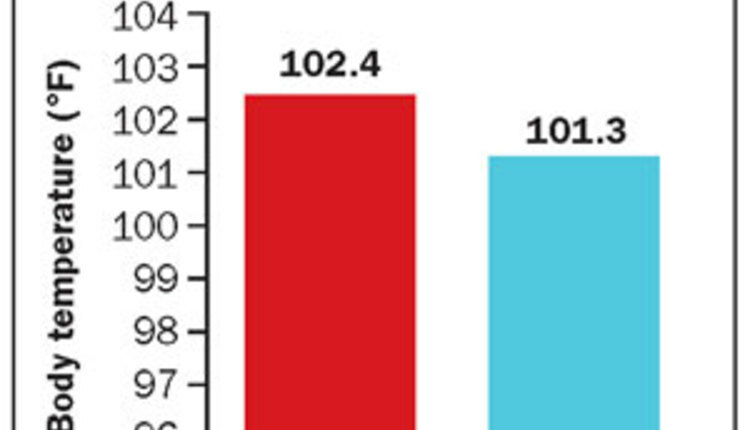 DMI declines as stocking density goes up. Aim for at least 30 inches of bunk space per animal in both the prefresh and fresh cow pens. Studies have shown that, when headlocks are employed, only 80 percent of the headlock space is used at a given time. Size pens appropriately for the herd and allow for peak calving fluxes. Limiting excessive stress on the animal is yet another important non-nutritional factor to consider. 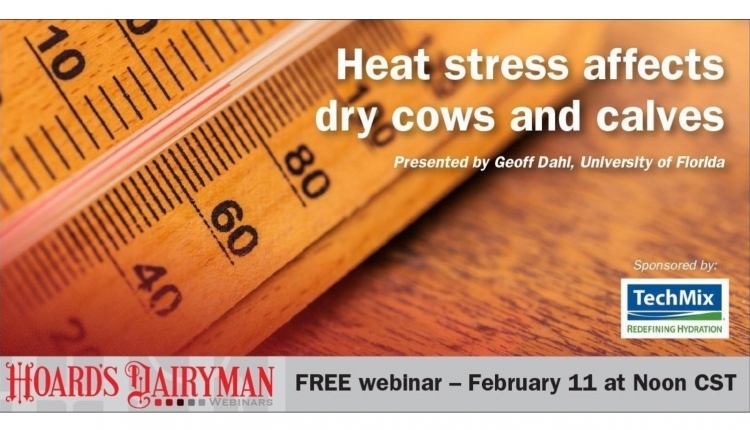 Heat stress reduces feed intake and raises the likelihood of an animal calving earlier than its expected calving date. Make sure fans are running in the prefresh pen to help alleviate heat stress. If possible, run the dry cows through the sprinklers in the holding pen at the same time you push them through the footbaths. Along with heat stress, consider the number and timing of animal movements. Whenever possible, limit the number of times you move animals within the last three weeks of their dry period. 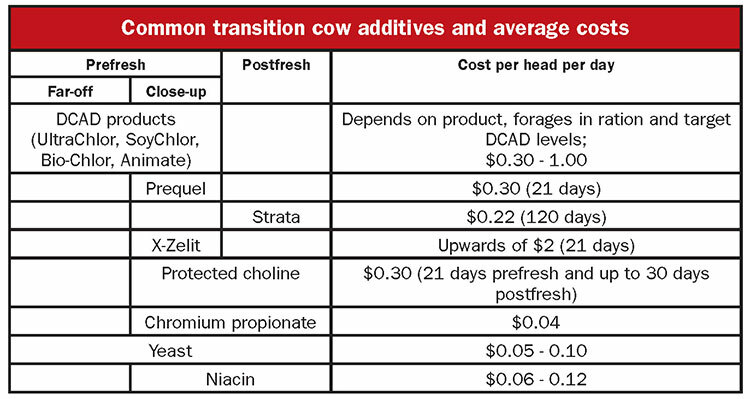 If feeding for a two-group dry cow program, the transition to the close-up group should be done three or four weeks prior to expected calving. The final move would then be at calving with just-in-time calving or the move to a bedded pack about a week prior to calving. Nutritional strategies and additives to assist with a strong transition are vast and plentiful. 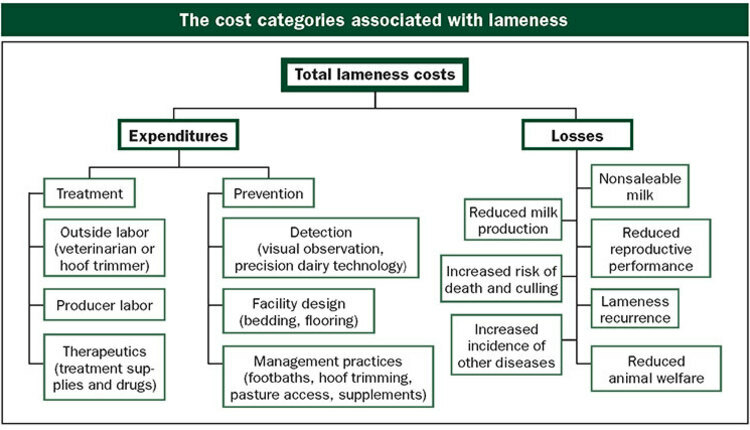 The table can assist you in determining when a feed additive can be employed as well as the associated costs. Outside of additives, a farm can support a healthy transition nutritionally without breaking the bank. For example, if your facilities and herd size allow, feed a two-group dry cow program. Far-off cows require less crude protein (CP) in the ration. Close-up cows should consume rations with 14.5 percent CP. In contrast, far-off rations can include haylage to reduce the level of purchased protein needed and maintain a 12.5 percent CP level. Calcium levels are also far less impactful for far-off cows. 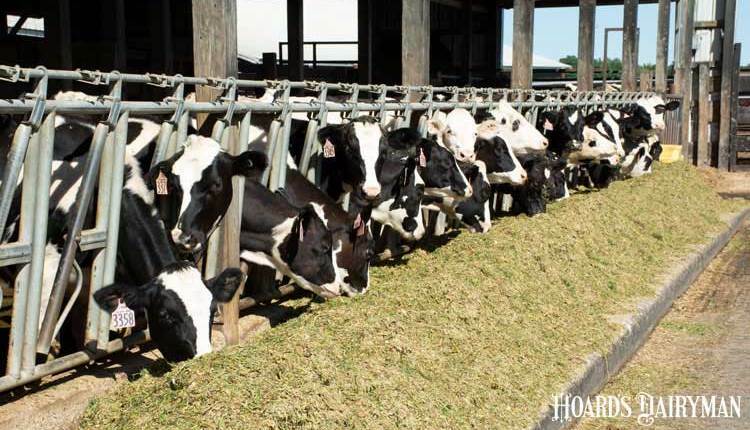 If a two-group dry cow feeding program is not easily implemented on your farm, consider feeding a moderate level of CP (12.5 to 13.5 percent) to the whole group, but separate the far-off and close-up cows with a gate. You can supplement the close-up animals with a topdress or add-pack that allows you to spike the ration with extra protein (14.5 percent), starch (to maintain the energy level in a ration as intakes decline), vitamins A and E, phosphorus and magnesium, and additives that support a healthy metabolism. Postfresh animal rations are designed to provide a higher level of nutrition. 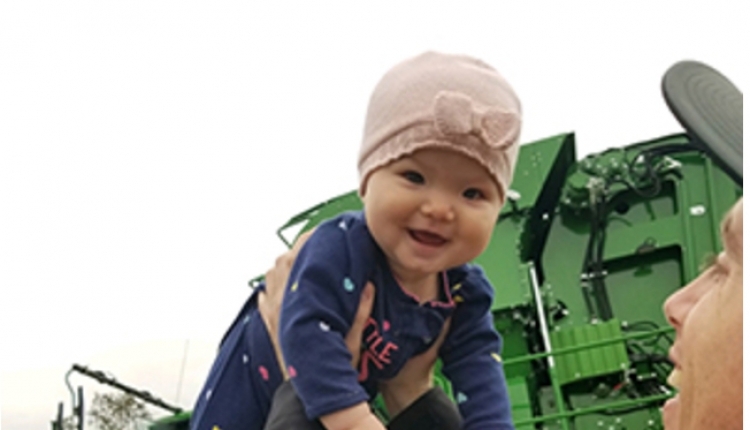 This supports lactation performance while also maintaining adequate neutral detergent fiber (NDF) to facilitate the transition between forage and starch-digesting rumen microbes. Therefore, forage content is often higher in these rations and often then a pound of straw is added as well.